« CB Chris Johnson Flagged for Thanking God? 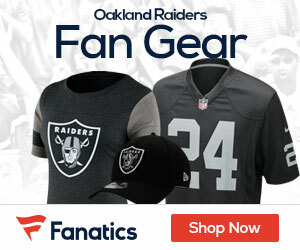 Head coach Tom Cable is yet to name Justin Fargas the Raiders’ starting running back for Week 5 with Darren McFadden (torn meniscus) on the shelf. The starter will either be Fargas or Michael Bush, and Cable could just go with the back that is moving the ball better against the Giants. Won’t matter if you can’t pass. Its gonna be windy here, east coast has been like tornado alley all week. Misdirection runs could work, Giants D are considering this a “highlight” game. They are chompin at the bit. What happened to that old school raider counter play that Bo, Marcus Allen, hell……even Harvey Williams used to “Beast” out on?